CAPE CANAVERAL — Plans to launch a Navy communications satellite aboard an Atlas 5 rocket early Monday could be interrupted by Tropical Storm Erika, expected to strengthen into a hurricane, as the cyclone puts its sights on Florida. 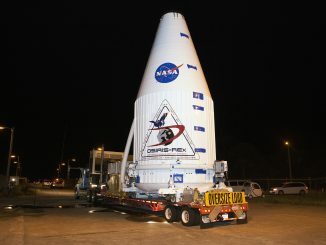 Officials could decide during the Launch Readiness Review on Friday, or perhaps as late as early Saturday, whether to proceed with rollout of the rocket from its assembly building to the launch pad at Cape Canaveral’s Complex 41 around mid-morning Saturday. 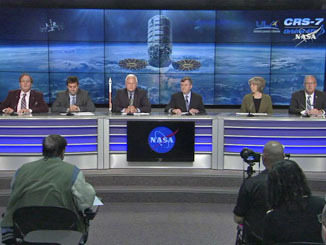 An on-time rollout Saturday would preserve the chance of trying to launch as planned Monday. But officials could, instead, choose to leave the 206-foot-tall booster in the safe confines of the hangar until the storm passes. If the rocket is fueled during the countdown for a launch attempt, it would take 24 hours before a rollback to shelter could occur. The 11 p.m. EDT forecast Thursday from the National Hurricane Center has Erika brushing along Florida’s east coast on Monday and Tuesday as a minimal hurricane and winds gusting as high as 85 mph. Local weather at Cape Canaveral is expected to deteriorate starting late Sunday. It would be the Sunshine State’s first hurricane hit in a decade. The workload and the predawn launch time mean rollout happens roughly 44 hours before liftoff. A Monday launch is timed to occur at 6:07 a.m. EDT. The launch opportunity moves four minutes earlier for each day it is delayed. 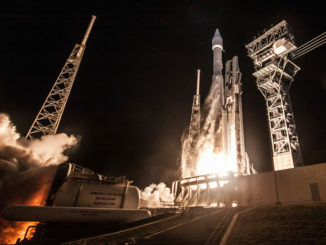 The United Launch Alliance rocket is carrying the Navy’s fourth Mobile User Objective System mobile communications satellite. MUOS No. 4 will fill the last remaining gap to create global coverage for the military’s new rugged smartphone system.